See the web-slinging hero battle evil villains, plus Bono perform songs from the musical's score! After more than eight years of production, with delays, staffing issues, financial crises, and other problems pushing the bill to $60 million, the most expensive musical in Broadway history, U2’s Spider-Man: Turn Off the Dark, will finally open on Sunday for its first public previews (it officially premieres in January). “What we didn’t realize was how difficult it is to stage this stuff, both technically and financially,” Bono, who wrote the show’s music with U2 guitarist the Edge, recently told the AP. CBS News has been tracking the production of the musical for a 60 Minutes special, set to air Sunday at 7 P.M. EST / PST. The preview clip below shows action shots of the elaborate stunts, with Spider-Man battling a villain high above New York City’s sprawling Foxwoods Theatre. 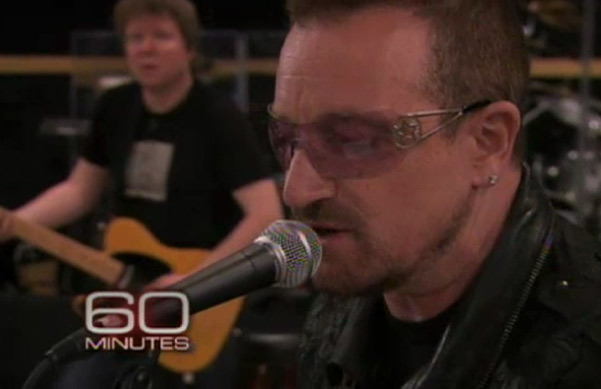 There’s also footage of Bono, the Edge, and Tony Award-winning Broadway vet Julie Taymor (The Lion King), who directed and co-wrote the play, in a studio rehearsing their songs with the cast, and Bono even steps up to the mic to show ‘em how it’s done! Will you see the previews for U2’s Spider-Man: Turn Off the Dark? Watch the video below, then tell us what you think in the comment section.